Emperor penguins fly several feet above the water to land on ice at higher levels when threatened by a predator. People also fly beyond the limitations of their daily lives under life-threatening circumstances. Flying Penguin explains how to transform people who waddle along as penguins into soaring eagles by awakening the vast human potential sleeping within them. 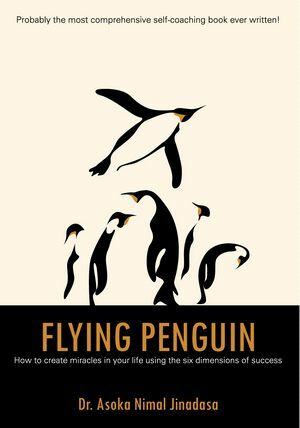 Flying Penguin explains how you can energize and empower yourself at any age by using an invigorating cocktail of oriental energy methods blended with latest discoveries in behavioral psychology, neuroscience, genetics, nutrition, and healthcare. How you can experience the thrill of freeing your wings and flying far beyond the limitations of your everyday life. Containing 132 online references packed into 139 pages, it is probably the most comprehensive self-coaching book ever written.